S & J Stearns, Inc.
Murphy & Son Construction, Inc. Comment: The chimney is connected to a dual oil boiler and wood boiler.\nIt is lined. The access is through an inspection door in the basement. the challenge is a right angle to the flu. The chimney runs from the basement up a floor and out a cathedral ceiling. The flu is very large. Comment: I would like to have two concrete outdoor stairways re-positioned, as they are are receding and are safety hazards now. The front stairway, leading into the house, has three steps and a railing. The back, leading into the garage, is only one stair, but it receding as well. There is also a walkway up to the front stairway that I am considering getting relaid with existing materials, depending on the price. Wondering if your firm offers other more general contracting services, such as power washing the house, cleaning gutters, general repair (outdoor shed, interior door that does not close, garage door that is off the track). Would like to work with one provider for all needs if possible. Comment: I have a front porch with stairs that is receding and needs to be repaired. I also have a one-stair entrance into the back of the garage that needs the same repair. They need to be set straight and leveled. I also need to have a stone wash path installed in the back garden area. Another project would be to level the entrance to my garage. At the moment, there is a slight drop from the concrete slab to the asphalt. I would like to do this some time in the fall. I would be happy to have you come out and do an estimate. Middlebury Concrete Contractors are rated 4.79 out of 5 based on 40 reviews of 9 pros. 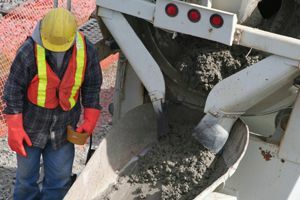 Not Looking for Concrete Contractors in Middlebury, VT?